(20/04/2011 08:53 AM)The Patriot Wrote: i tried it using another memory card(completely formated) but it still doesn't work! Oh, well i have the same PSP model as you, and it worked without a problem. 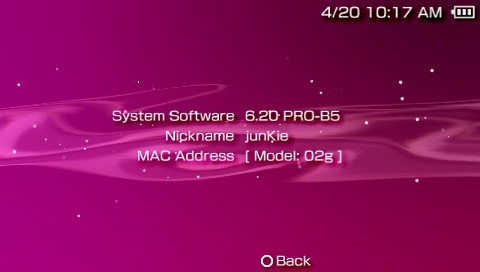 Most of the users are having trouble by starting the updater or install pro-b5 » black screen. If there was a perm patch for TN-E, i would so totally be in it. also i would nvr try a permanent patch on my PSP-Go anyway,..
WOW! 6.20 PRO-B5! IT WORKS FOR ME! what should wee install ?? im totally freaked out about this ..